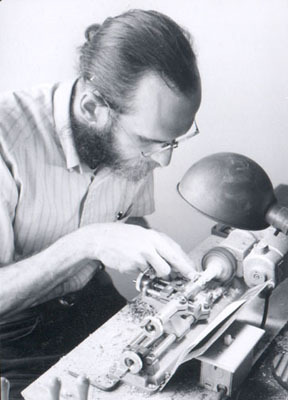 In 1977 I bought a miniature lathe, built by Unimat. This was the ultimate tool for a model maker, when I was growing up. The opportunity to purchase one used was too much to pass up, even though I had no idea what I would use it for at the time. 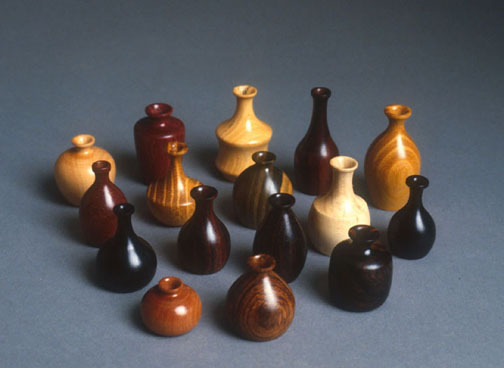 I started turning small vases, to sell at shows being presented by the Mendocino Woodworkers. These little vases are 1" scale, which means they stand no higher than 3/4" tall. These are all natural hardwoods from around the world, finished with a brushing lacquer.